It’s disappointing but no surprise that the electronic music scene is still rife with misogyny, homophobia and transphobia. I can’t even begin on what a flaming pile of sexist garbage most techno forums are, much less what it’s like offline. Fortunately there's a rising counter movement to that world, and Eris Drew and Octo Octa are part of the leading charge. 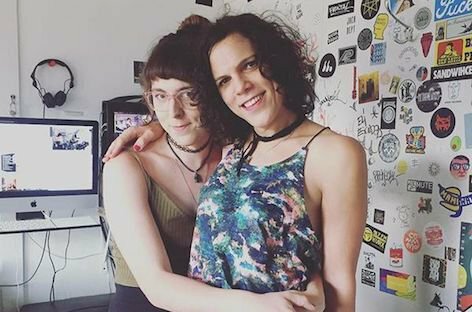 Both have been notoriously open about their experiences DJing as queer trans women and they've been producing some serious bangers while at it. With that in mind, the first half of the record is Eris Drew’s. To give some background, Eris has been DJing since the 90s, but perhaps she took off when The Black Madonna took notice and added Eris to her Smartbar roster (alma mater of house legend Frankie Knuckles). Eris’ philosophy originates from what she calls the “motherbeat,” a divine and psychedelic femme energy she brings to her music and parties. After all it's not rave music without a pseudo-religion guiding it. Eris has definitely found the motherbeat in this EP, and you can see it in everything from the Paganistic album art (from the horror film The Wicker Man), to the otherworldly quality of these tracks. When it comes to said tracks, Drew starts off with “Hold Me (T4T Embrace Mix),” an old-school breakbeat with a groovy lead. A feminine voice echoes on and off throughout the track and it’s all around euphoric. This is the party track of the record. It definitely showcases some aspects of disco and old school hip-hop, which are great. While I literally can’t find track 2, “Trans Love Vibration,” online anymore, you should know it was one of my favorites. And if you can find it please tell me. Now I absolutely adore Octo Octa. I was late to the party, but the Brooklyn-based DJ caught my eye with her 2017 release on Honey Soundsystem, Where Are We Going? It was a raw look into the complicated array of feelings she went through as she transitioned in the public eye, and she did it in a way few electronic artists can. It seems to have done her well since she's playing Berghain later this month. Her side starts out with some real atmospheric melodies and off-kilter handclaps before a dirty breakbeat kicks in on “Beam Me Up (To The Goddess Mix).” This one is classic Octo Octa. The "Please Take Me Away Mix" takes atmospheric to the next level, and the result is truly divine. We’re still grounded by the driving house beats that act as a glue between each track in an otherwise genre-crossing record. It’s a fantastic way to end an EP that is so based in the “ecstatic love energy” Eris Drew and Octo Octa espouse. It feels cosmic. This record is so well-put-together that it sounds like it could have been around for decades, but at the same time it feels completely groundbreaking. I love. Recommended: "Hold Me (T4T Embrace Mix)," "Trans Love Vibration," "Beam Me Up (To The Goddess Mix)"